When I was a kid, my mom gave me a single dollar bill to place in the offering plate every Sunday. While she doesn’t still give me my tithe money, her lesson changed my life. It got me into the habit of giving back to the church at a young age. Now, my wife and I tithe to our church entirely online. The process is automated every single month to withdraw from our bank account. Online giving wasn’t an option when I was growing up, but now it’s how I do nearly all of my charitable donations. However, our church still passes around an offering plate every week during worship. Why would we still pass an offering plate at church when digital giving is so much better for the health of the church? Since we give online, there’s nothing for us to put into the plate. So what gives? I don’t care about being seen while giving, but I can’t help thinking that we’re missing out on something when we give up passing the plate—especially when it comes to setting an example for the next generation of church givers. 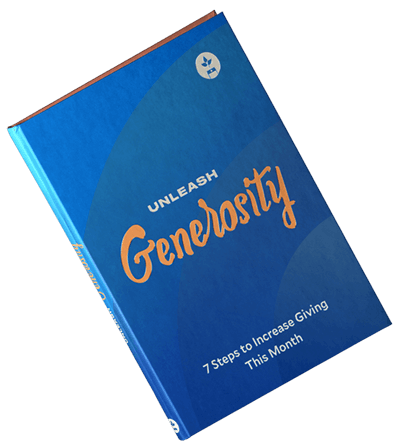 What if more churches gave something for their online givers to do during the offering part of worship? What if there was some way they could show that they support the church financially, while also encouraging others to give? I believe more churches could give online givers the option of participating in the giving portion of worship. That tiny change would allow online givers to feel like more a part of the giving process. Even better, these markers would be a subtle hint to new visitors or non-givers that the church has an online giving option. Or remind current in-person givers that they have another option for donating to the church. When I had this idea, I immediately assumed that I wasn’t the first person to have thought of this. And I was right. Some churches already have ways for online givers to engage with the offertory time during in-person worship. I asked around on social media to see what churches were already giving their online givers a way to engage with worship giving. churches tell me how they incorporate digital giving with plate passing. These church responses changed my entire perspective on digital giving. Put an “I give online” checkbox option on your physical envelope. Supply “Online Giving” stickers that members can place on the envelope. Invite online givers to hold up their phones during offering time. Give your members free card templates that any member can print and place in the plate on Sunday (like these, by Dan Wunderlich). In addition to the examples and suggestions, there were a number of negative responses. One user said that if online givers really want to participate, they should just drop a dollar into the bucket. Another sarcastically suggested creating a card that says "I care entirely too much about what other people think of me." One guy said it just rubs him the wrong way. The obvious reason for this negative reaction is that it insinuates that we need to be seen giving. The only reason you would want to tell others that you give online is because you want to impress them (or so it’s thought). I certainly agree with her last point. We shouldn’t give to the church because we want to impress other people or feel important. But when new visitors see members of the congregation adding things to the collection plate, they’ll better understand how giving the church is. If online givers want to give a symbolic dollar bill instead, that’s certainly an option, too. But we’re living in an increasingly cashless society—a trend that most younger generations are following. Plus, online giving is actually more secure for churches and easier to automate for givers. Doesn’t mean we should do away with in-person giving during worship services. It’s still the preferred way to give for some, and there’s a significance in the transition. Figure out a way to combine analog and digital, old and new, offline and online. If your church is looking for the best online giving option, look no further than Tithe.ly. Sign up your church for Tithe.ly giving and get started with digital giving.